My family has a code phrase for things that are a big deal: If you don’t fully understand why but you hear the helpful phrase, “It’s a $7 ham,” you know it’s something to celebrate. This week, two new looping treasures have come into my life. One is a gift that adds another another layer to the tale of two bags I wrote about last time. The other, an out-of-print book, is a $7 ham (cue the confetti). 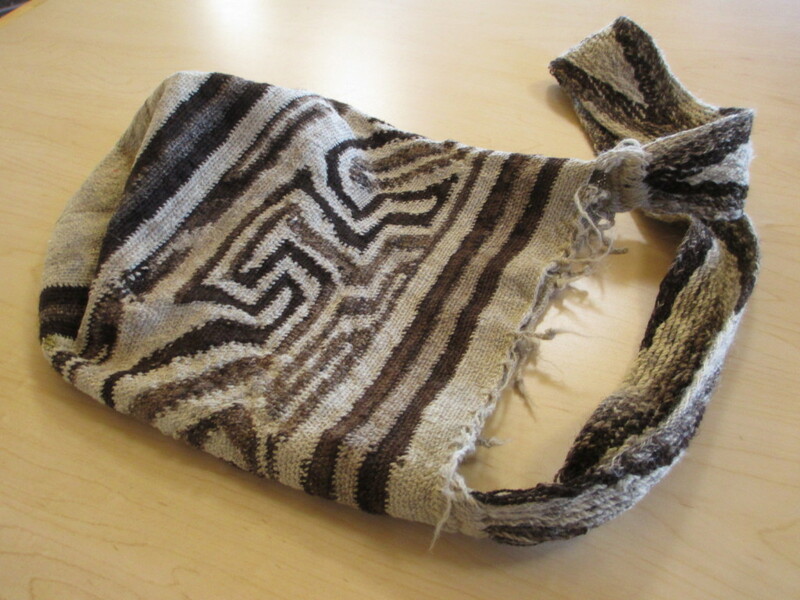 This nettle fiber Akha bag arrived in the mail this week, an unexpected and cherished gift from my friend Tressa Sularz. Two new (to me) bags came into my life this summer. They brought two new people into my life, at two different events, and two new examples of looping from different parts of the world to spark conversations when I carry them. In casual conversation with non-fiber people, I try to keep a lid on my enthusiasm for a technique many people have never heard of. Don’t want to scare people with raving and weird vocabulary. But when someone wants to talk about looping and asks great questions? You can’t begin to know how much I appreciate it! Leanne Jewett did just that when she interviewed me for the artist profile in the National Basketry Organization’s Spring 2015 quarterly magazine. It arrive yesterday, and NBO gave me permission to post a PDF of the four-page article. You can read it here. 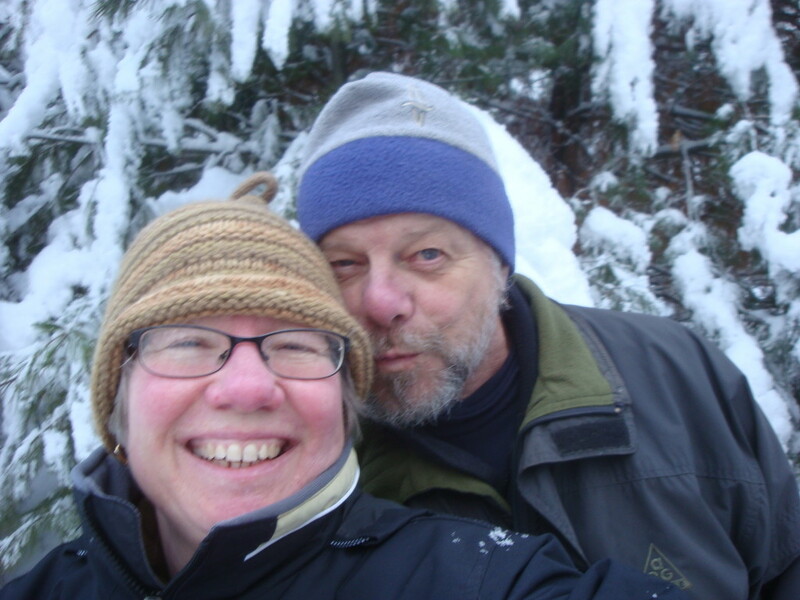 There’s still time to register for my July 15-17 workshop New Age Looping: Process and Possibilities at the NBO biennial conference in St. Paul, Minnesota. The class is open to all levels. We’ll cover basics, even if you’ve been looping for a while (I’m a big believer in solid fundamentals), then I’ll be able to tailor challenges for students of different experience levels and interests. Want to come spout weird vocabulary with me? For thousands of years, people have learned to make the most of materials they can grow or gather locally. To celebrate that tradition, for an exhibition in Iowa this summer I’m sending a looped basket made from white pine bark I gathered in my own yard. 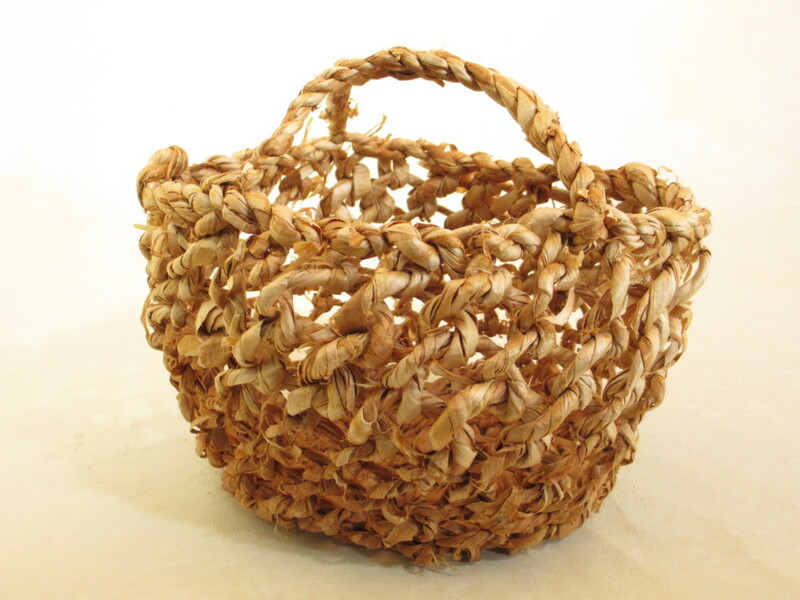 The show is American Baskets: Made To Be Used at the Philip Dickel Basket Museum Gallery in West Amana, Iowa. The technique was inspired by the Swedish bastabinne tradition. There are very good videos that show bastabinne looping technique here and here. It’s amazing how much changing the point of view changes your perspective on something. As an instructor at the 2015 National Basketry Organization biennial conference, I was invited to have work included in the exhibition. The plan in my head was for a hanging installation. But when a bundle of willow hoops in my studio came untied one day, the scattered pile reminded me of a shoal of fish. Starting January 1, people who sell digital products to buyers in the European Union are expected to collect and pay VAT based on and to the buyer’s country, not the seller’s. So even though I’m in the US, I’ll be liable for the VAT — which varies by EU member country — in each and every country of residence for buyers of the ebooks, PDFs and online classes I sell as digital downloads on Etsy. There is no threshold for reporting, so there’s no such thing as “too small” to file VAT. And the documentation requirements for proving the buyer’s location are onerous. Etsy say they’re working on this issue, but for now anyway I can’t count on them to make my compliance simple. 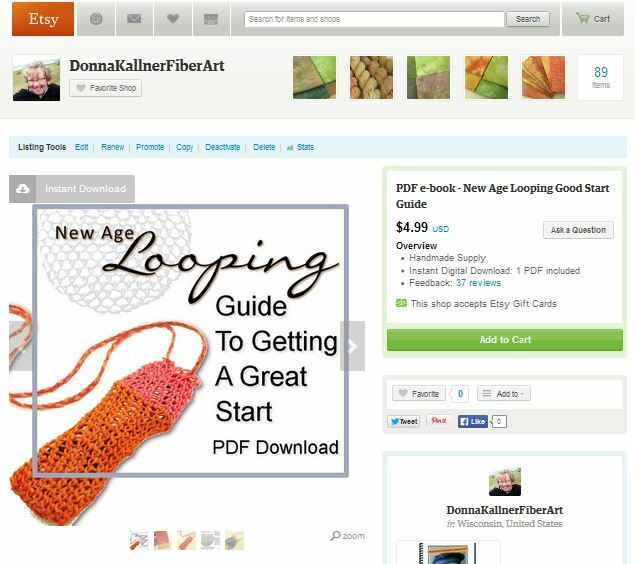 Etsy has been a great way for me to get found by a global group of people interested in looping, so I don’t want to leave the platform. And I don’t want to break the law, even though many people say it’s unenforceable. (If you want others to obey the laws in your country, you make every effort to obey the laws in theirs.) I could register with a VAT MOSS (mini one-stop shop) in an English-speaking EU country and just do quarterly reports there, to be dispersed to any of the 28 EU member nations to whom VAT is owed for that period. But since I’m not able to meet the data collection requirements, that seems pointless. 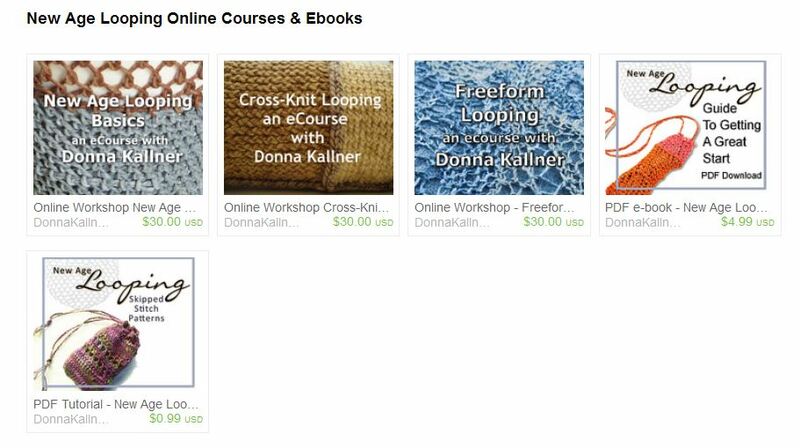 A lot of small ebook and pattern sellers are wondering whether to remove their products from the marketplace, break the law, or make do with alternative delivery methods. I decided to go with alternative delivery methods. The research I did indicates that as long as the services you offer have “more than minimal human involvement,” i.e. they are not primarily automated, they are not considered e-services so are exempt from VAT (at least for now). 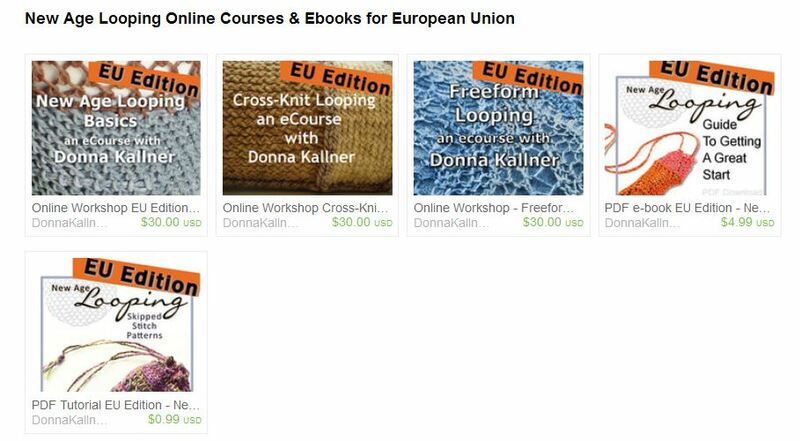 So I’ve added new Etsy listings for EU buyers of my ebooks and online courses. Those listings are now classified as “physical items” and will be delivered via email instead of as Etsy digital downloads. I’m hoping the file sizes are lean enough to deliver without headaches on either end of the transaction. I’m keeping my fingers crossed that my EU customers use the EU listings, and buyers in the rest of the world use the listings that let them get their purchases immediately as digital downloads via Etsy.Comply (or at least try) and move on: That’s my intention. All the new listings are now live on Etsy. And as the clock ticks down to the end of 2014, I hope my ducks are mostly in a row for now. At some point, I hope Etsy and/or the EU find some room for the realities of small sellers in regulations intended to keep large sellers (like Amazon) from evading taxes. So I’m viewing this as a work-in-progress and subject to change. But in the meantime, I intend to start the new year with bubbling cauldrons of natural dye and do some stitching, which is always Very Agreeable Time. Long drives to and from events are a good time for thinking through pieces for exhibitions. I was crossing the Mississippi River when my thoughts came together for 20 For 20. 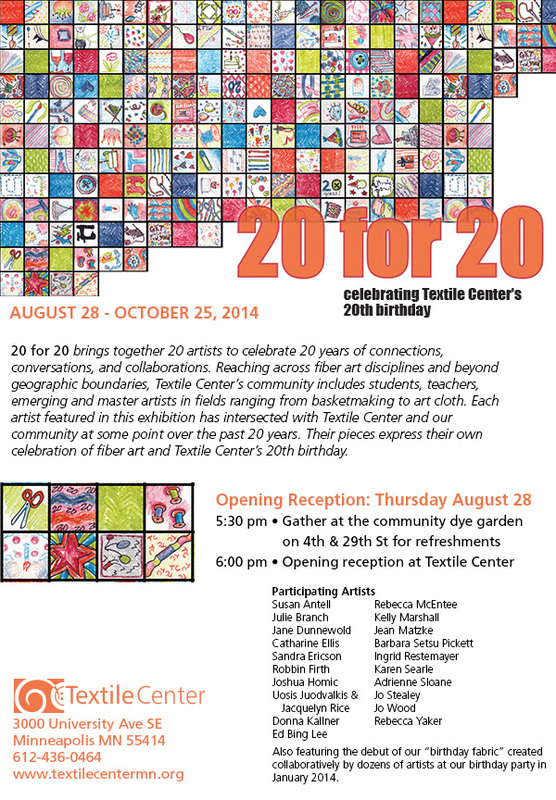 The show is a 20th anniversary celebration at the Textile Center in Minneapolis. 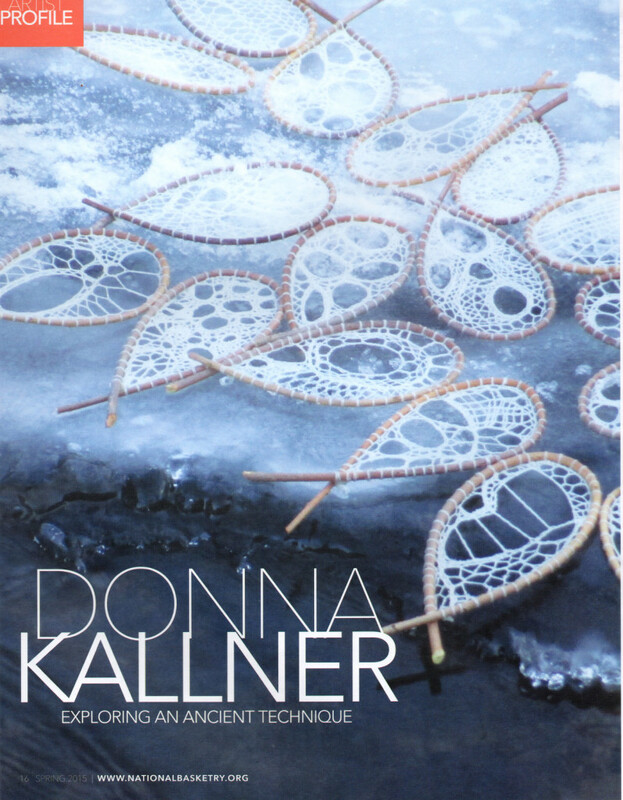 Ripple Effect by Donna Kallner. 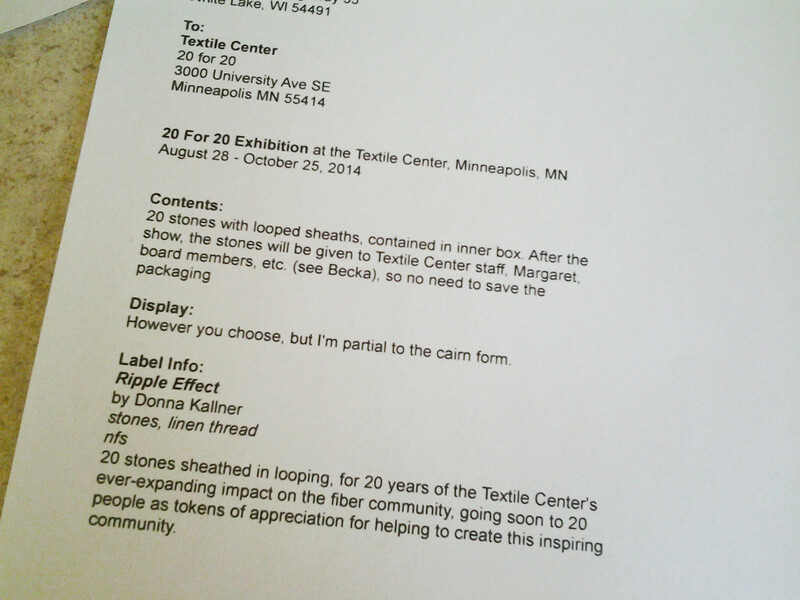 The Textile Center has had a huge impact on the fiber community, and that impact reaches far beyond the Twin Cities, far beyond even the people who’ve actually been there. Knowledge and enthusiasm and inspiration spread like ripples in water when you drop a stone into a river or lake. 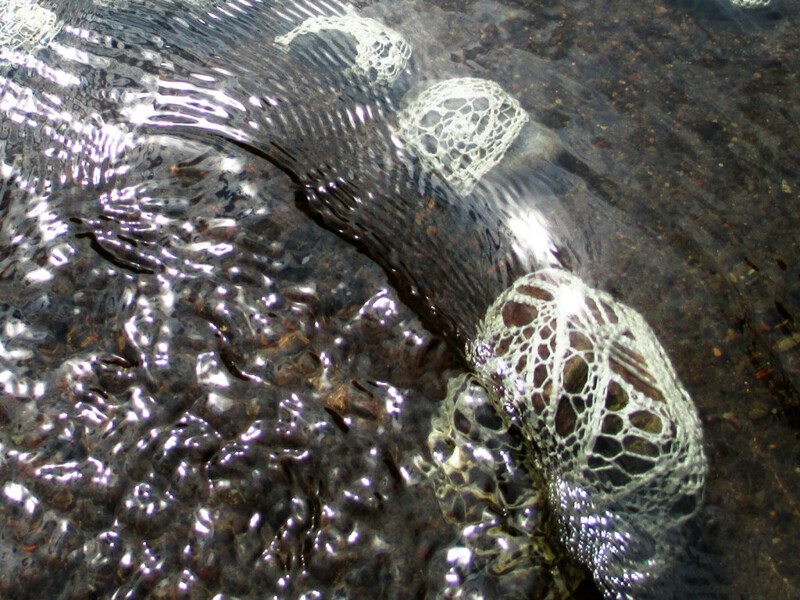 That ripple effect is what I wanted to celebrate in this exhibition. 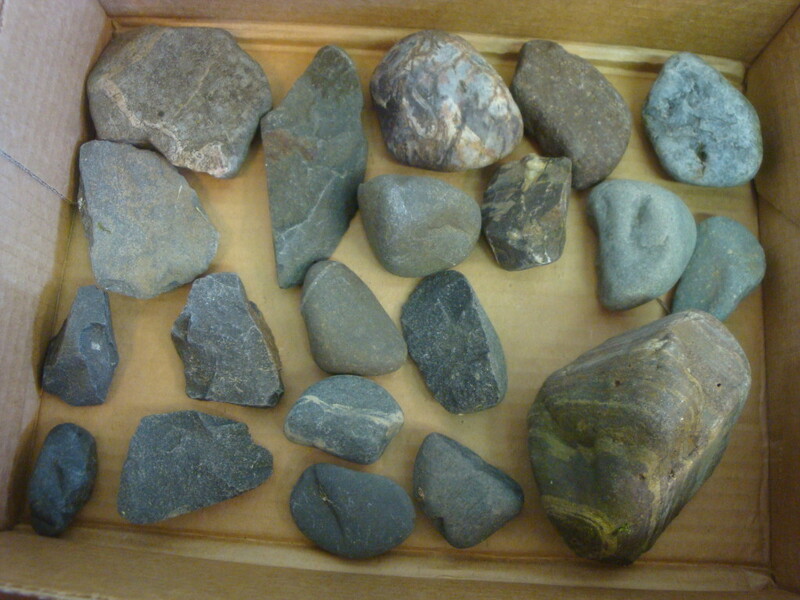 So when I got home, I collected 20 stones of varying sizes and got to work. For the past few weeks I’ve been looping sheaths for the stones. 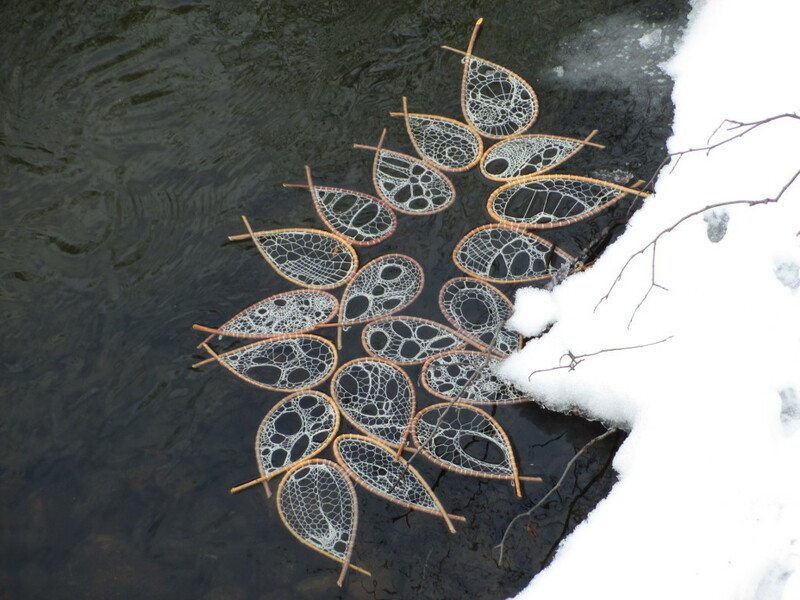 When the last stone was finished, I took them to the Wolf River near where I live. 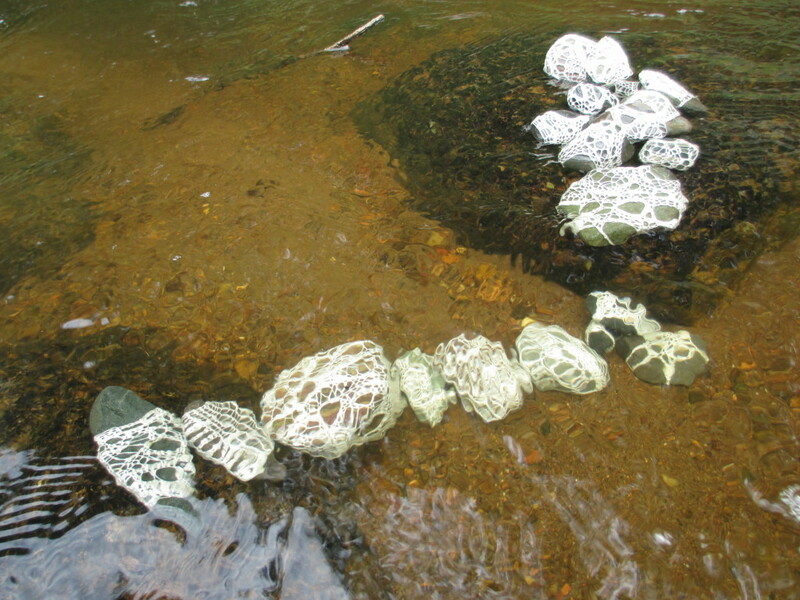 At least once, I wanted these stones to be dropped into water. I was also auditioning different ways the stones might be displayed during the exhibition. I’ll leave it up to the staff in the gallery, but I’m partial to the cairn shape. 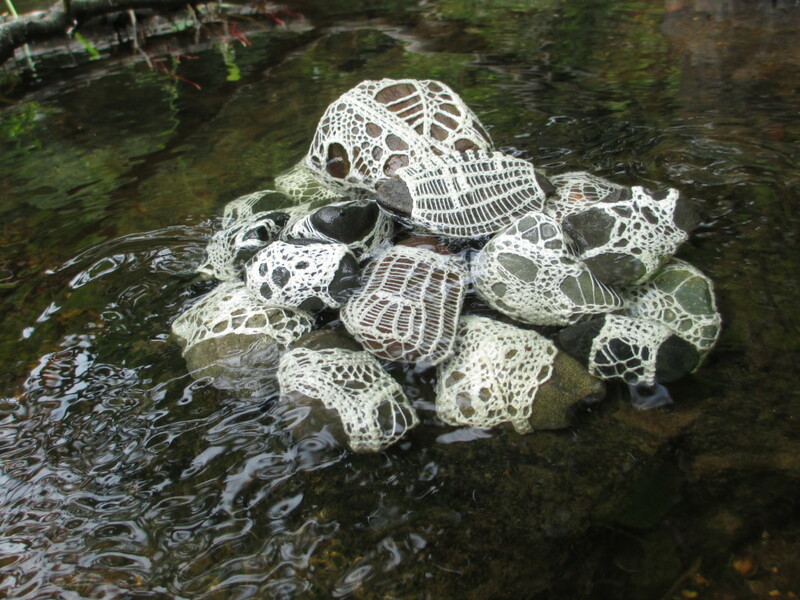 Cairns make me think of trail markers, and I think the Textile Center has helped a lot of fiber artists find their way over the past 20 years. 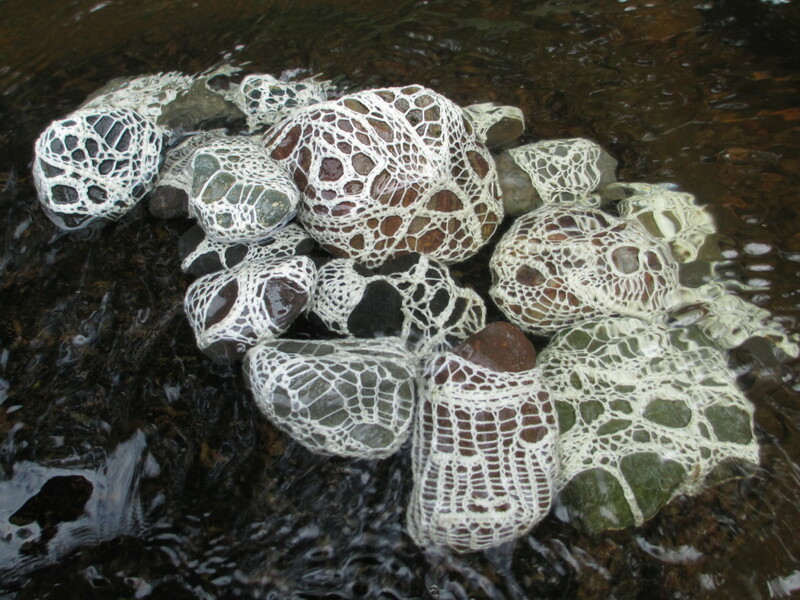 After their bath in the river, I washed the stones. They’re dry now, and on their way to the Textile Center. They won’t be coming back to me after the show. 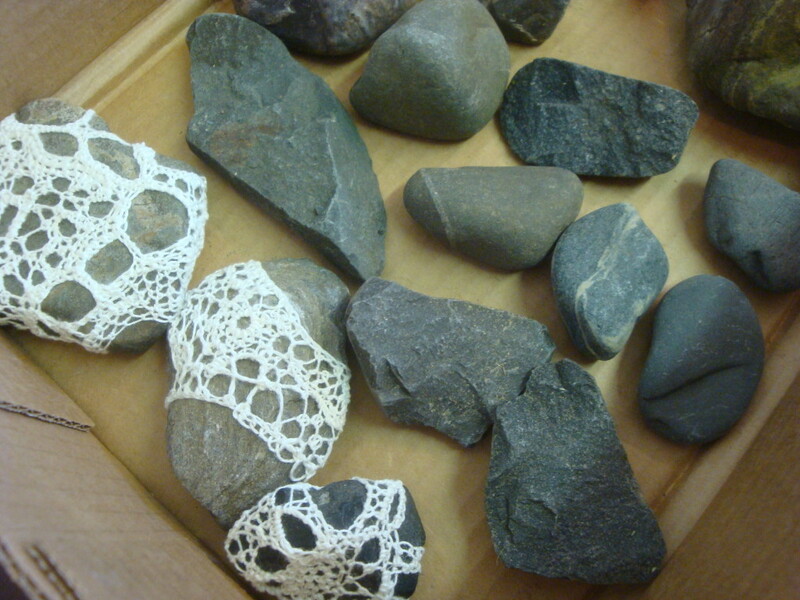 I’ve asked that the stones be given to the Textile Center’s staff and board members as small tokens of thanks for helping to create an inspiring community. Spending a morning wading in the river taking pictures gave me a chance to reflect on all the wonderful people who’ve been part of the Textile Center. I’m especially grateful to Jacki Bedworth, who first offered me the opportunity to teach there as a visiting artist, to founder Margaret Miller and to Becka Rahn. I’m grateful to every single person who contributed to the astonishing textile library, and to those who created the amazing dye lab, and to all the students who’ve taken my classes there. Special thanks are in order to the students who made do without irons when we were without power after one storm, and to the student who calmly pulled the plug when one of my garage sale irons was shooting flames out the back end in another class. Thank you to all the people who worked with the Textile Center on the Surface Design Symposium and on the SDA conference when it was in Minneapolis. 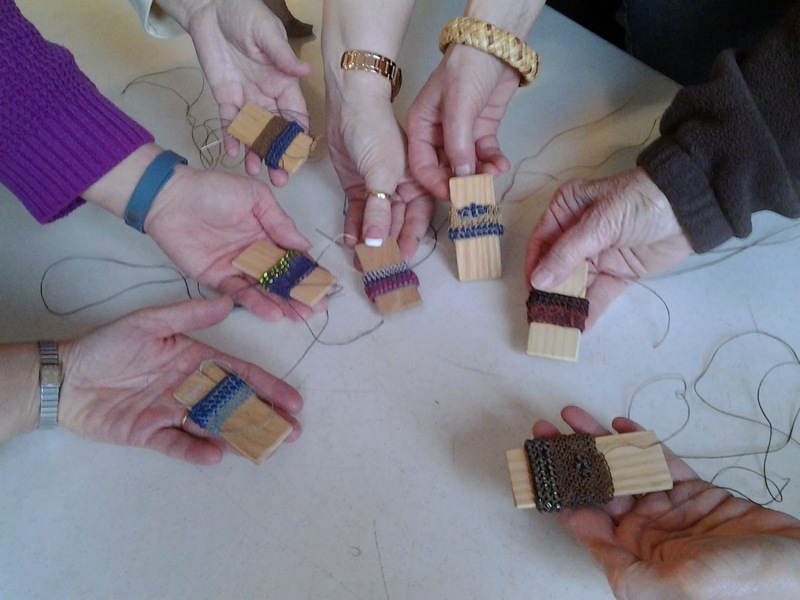 Thank you to all the donors and volunteers who make the annual Fiber Art Garage Sale a great success. Thank you to the Mondale family and all those who support the gallery and exhibition program. And thank you to all the guild members who contribute their energy to the place. Every time I visit, I see something that inspires me. And all that creates a ripple effect. 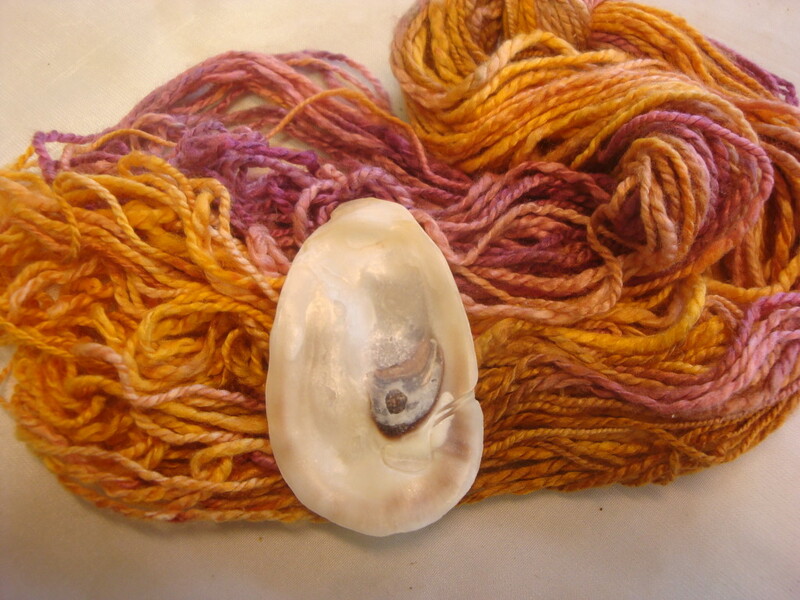 Students in my online classes know my preference for tonal threads, which I dye or paint myself. This project reminded me why I steer away from space-dyed threads in most looping projects. 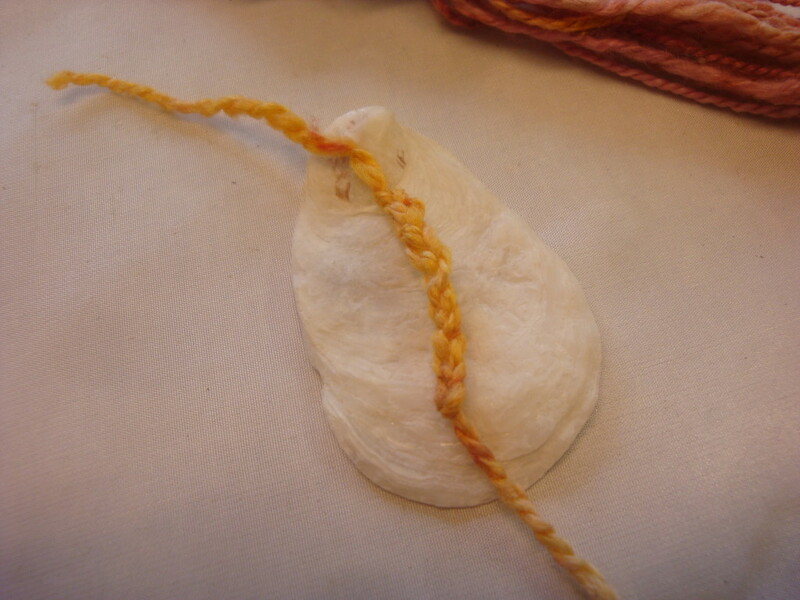 I’ve been meaning to overdye this silk thread, which I acquired some time back. But Mother’s Day kind of snuck up on me this year. Even if it feels more like March than May, Mother’s Day is Sunday. So yesterday I plugged in an audio book and got busy. 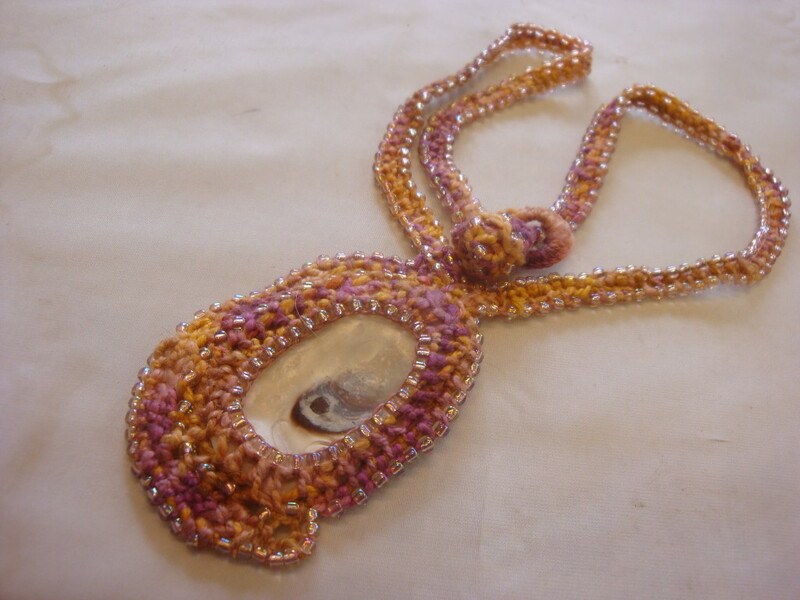 As-is, the colors of the thread worked with a shell piece I wanted to incorporate into a necklace for my mom. And the colors look like a Florida sunset — perfect for Mom. So I figured I could make it work, despite the weird “puddling” effect I generally get from space-dyed yarns. 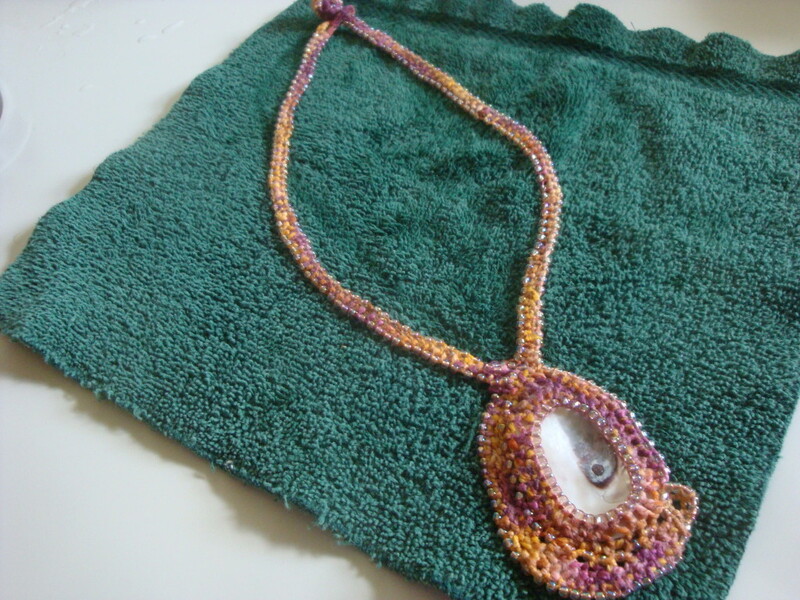 I used a needle chain start to make an oval piece that covered the back of the shell. 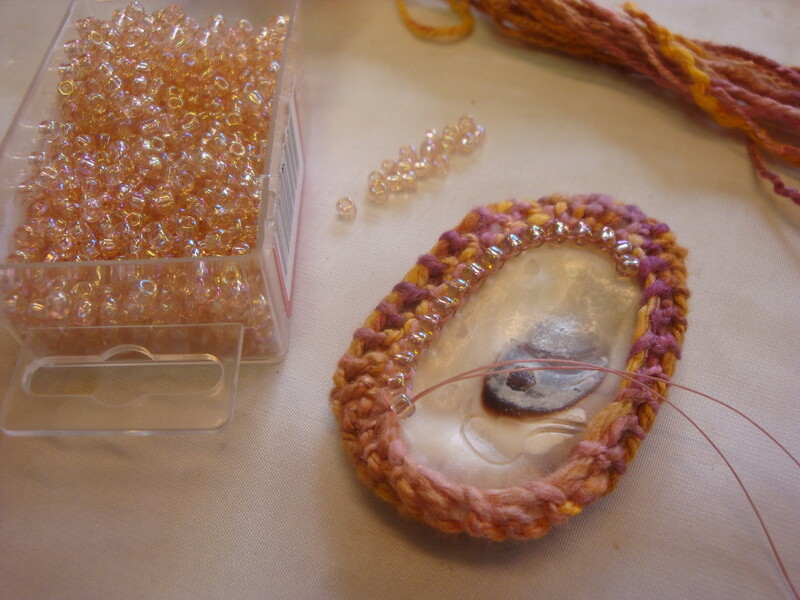 Then I decreased to cradle the shell in a silky “bezel”, edging it with a non-picot version of the beading technique in this video. 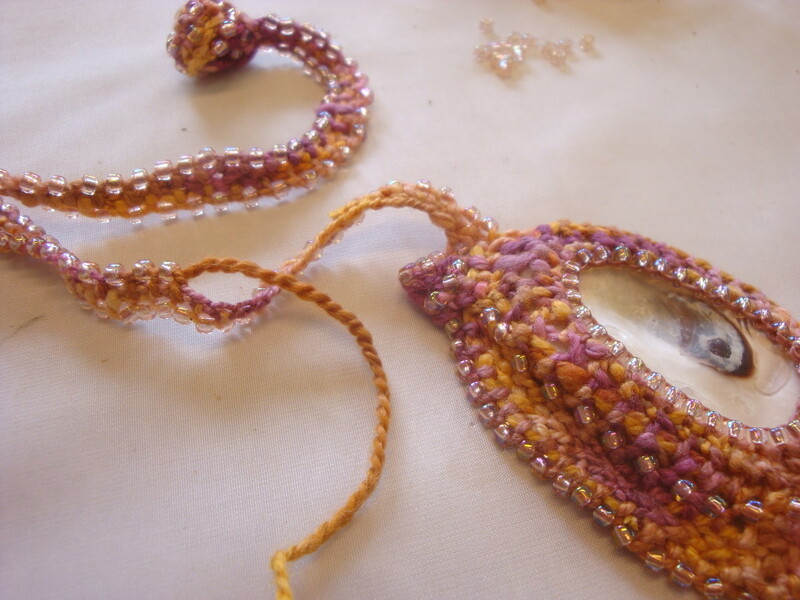 To complete the pendant, I worked more looping, incorporating some beads, around the shell. 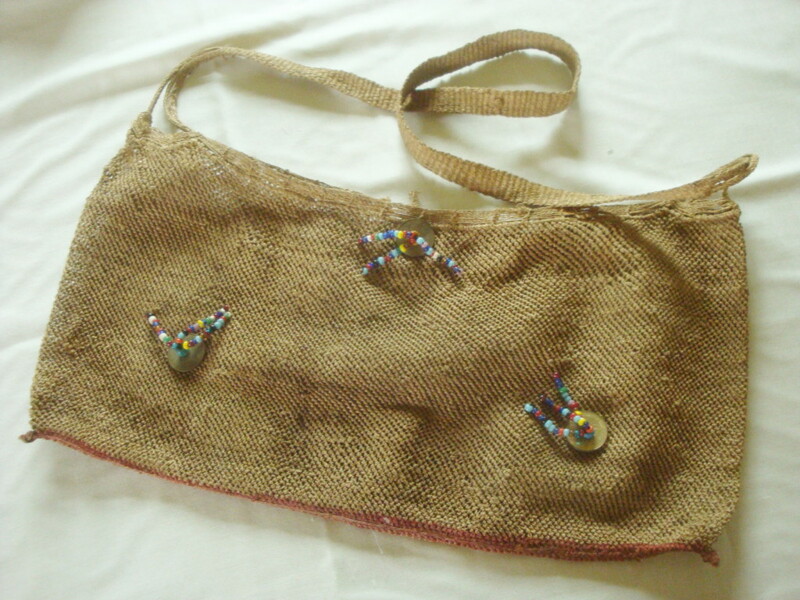 The neck strap is where the space-dyed puddling became a problem. 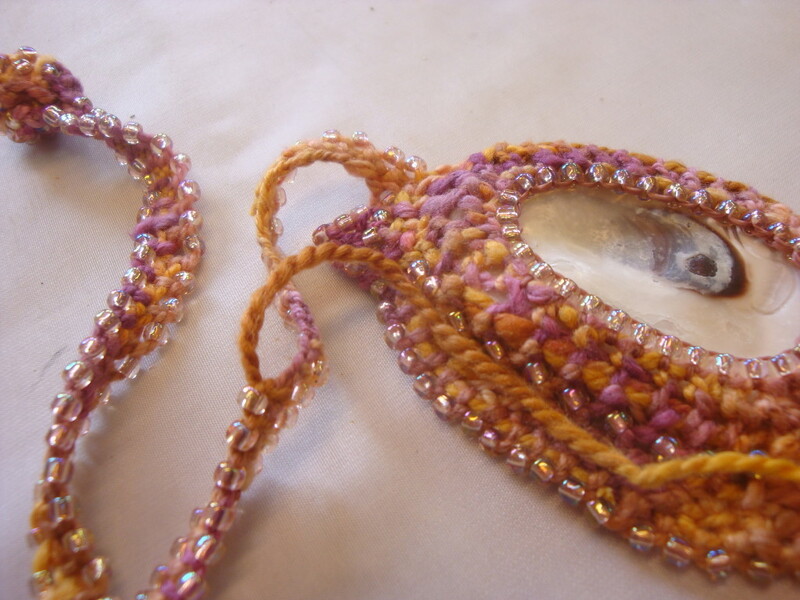 Mom’s skin is very sensitive, so for necklace straps I generally stick with silk and/or beads — no metal closures. Mom prefers her necklaces shortish, so instead of a continuous piece that slips over the head I planned a two-piece fiber “chain” with a loop and button closure. My first attempt was a double needle chain, which looked awful with the space-dyed puddling. After unstitching that, I used a single needle chain with bead looping along both edges of the chain. 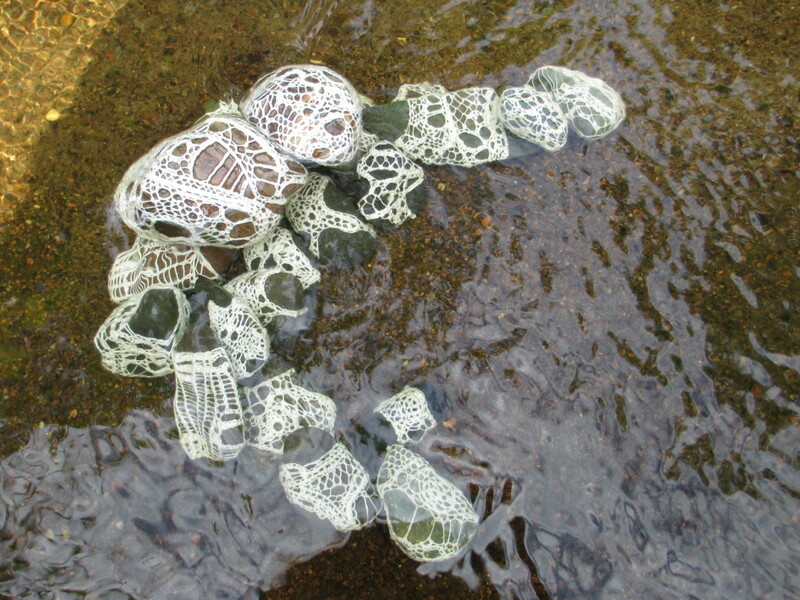 The extra thread from the bead looping helped mask the puddles a bit. This is what it looked like while blocking. I’ve had students do amazing work with space-dyed yarns by carefully cutting out short lengths of the colors they wanted. It’s reasonable to manage all those thread additions in the looping structure. But working in a lot of ends on a long needle chain is not much fun. A Russian join should work on a plied yarn, but I didn’t even try it on this silk. I just decided to live with the puddles. When it’s worn, I don’t think the splotchy colors on the strap will be the first thing other people notice. What I hope they notice is Mom’s smile when she wears it. It’s kind of a thrill to write this: I now have an Amazon Author Page. My formatting has passed the test. The Kindle version of New Age Looping: Guide To Getting A Great Start is now for sale on Amazon. I know some of you have been waiting ages for me to get this done. Thanks so much for your patience! If you have a different type of e-reader, other formats are available on Smashwords. Those should also be available soon on Barnes & Noble, Apple and other channels. And for good measure, I’ve added a PDF digital download version to my Etsy shop. It’s been a huge learning curve for me to get the formatting right so the e-book would work on so many different devices. I now have a cheat sheet that should save some aggravation next time. And I have lots of ideas for e-books to work on next. I wrote a bit more about my plans here. But I’m always open to suggestions. Want to help bump something to the top of the list? Tell me in the comments below. Why it never occurred to me before, I can’t say. But last weekend at Wisconsin Weave Away, someone asked about a handout for the alternating stitch neck cord I teach at the end of the Burundi Looping class. It’s a simple technique based on a structure that’s already familiar to students by the time I show it. And yet, students at conferences and retreats are usually getting tired by the time they see this. So I told them I would post a short video refresher. And here it is. This will live on the page with other video resources I’ve posted for students. If you can’t find this page again to use that link, look at the menu bar at the top of this site. There’s a pull-down menu under “Students”. It’s at the bottom of that menu.